In an interview with Nicolas A. John, a sociologist and media scholar, he talked about his recent book, “The Age of Sharing”, where he looks at the history and modern uses of the word “sharing.” This made me interrogate what the concept of “sharing” means in my life, and why/how we share in everyday life. For me, this concept of sharing manifests itself in my life through communities, art, and story telling. I’ve recently started using two very important community services: The Toronto Public Library, and also the track at the North Toronto Memorial Community Centre. Since my final year of university, I’ve had an interest in how city development and structure affect the development of communities. I studied how community services, like public libraries and community centres have a positive affect on individuals, families, and communities. However, now that I am actively taking part in these services, I am seeing the effect. With my recent goals of learning how to lead a healthy life, and also reading more, I realized that a gym membership, and buying books can come with a hefty price tag. But by having access to these resources, and sharing the books and space with a community, I not only get to develop as an individual, through pursuing my own goals, but this sharing has also inspired a stronger sense of pride I have more my community and my city. 2016 was a tough year for many people, as a number of great artists in film, TV, media, and art passed away. Art has such power, as it allows for emotions and feelings to be expressed. People find power, solace, and comfort in art. And when artists create, act, sing, and perform they are sharing their talents, sharing their emotion, and have shared something intangible with us. This past weekend, I watched Bright Lights, the documentary about Debbie Reynolds and Carrie Fisher, and their relationship as a mother and daughter as they moved through fame, Hollywood, and art. It showed their power, determination, hard work, and love. They have shared so much with us, and in their honour, we must continue to share art, and share in making art. Use our emotions, including our dark times, to make art, and express our emotions so we can learn about each other, support one another, and become a more supportive and inclusive society. This week, I blasted through season 4 of Please Like Me and also the new Netflix series, One Day At A Time. The storytelling through these two shows is so important and powerful. Please Like Me‘s take on queerness and mental health is a breath of fresh air, as it tackles important issues with a unique blend of humour and earnestness. 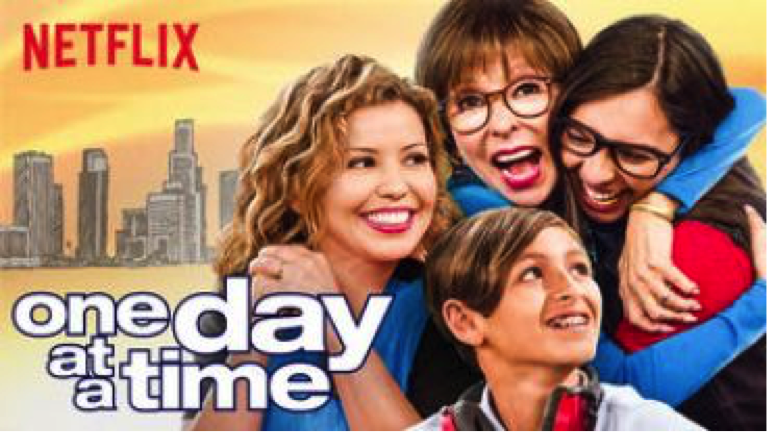 One Day At A Time is an amazing Netflix sitcom, that focuses on a Cuban-American family, and as a Latino, I often get major “rep sweats*” when Latino-centred productions are made. This show delivered though! Through humour and classic sitcom antics, it takes on issues such as veteran affairs, mental health, and coming out. Sharing stories bring validation to people’s lives. Sharing stories allows people to normalize conversations that can be difficult to have. And sharing stories gives the opportunities for more people to share as well. I may not be Cuban, but seeing a story about a Latino family is powerful. Through supporting these storytellers, it paves the way for more storytellers. Maybe one day, there will be a TV show about a chubby Guatemalan-Canadian kid with MS, that will not only obviously speak to me, but hopefully everyone else that might find a connection to those stories. Through sharing as public services, sharing through art, and sharing our stories, we can develop as individuals, and as communities. We share news, emotions, experiences, and memories. And I hope that through sharing, we also gain understanding, love, and community support.